Was up in Waimea Canyon a couple of weeks ago to celebrate a birthday. Luckily it landed on a day off and I was able to join in the fun. We hiked around the forest and then I brought them to one of my faovrite spots on Kaua’i for sunset. Getting down to this spot is a bit nerve wracking but worth it every time. I’ve been here on a number of occasionis and each time is incredible. As with my previous adventure here the light was doing some magical things. Before the sun dropped below the mountainside we had incredible beams in front of us. 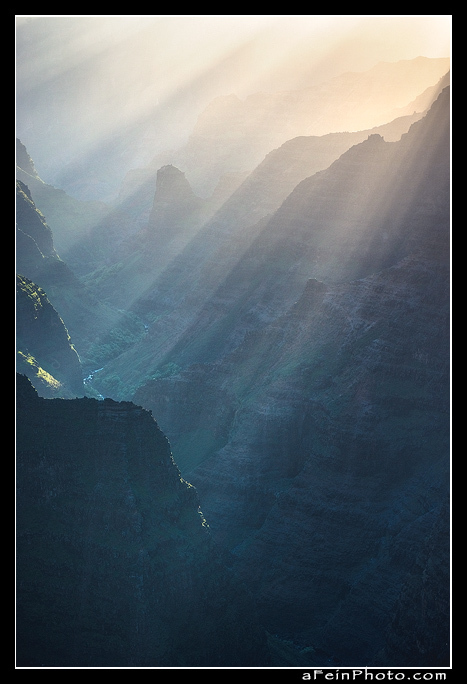 Posted in Image Discussion and tagged kauai, waimea canyon on January 22, 2018 by Aaron Feinberg. ← Previous: "Waimea Pier – Starry Night"